First race is Thursday, Aug. 31. After a very laid-back June, she ramped it up in July and has been running GREAT. Recent workouts include a 3M tempo run in 19:21 over a gradually rolling road course - by far her fastest. To boot, we had a total of FOUR girls under 20:00 in the same workout (two at 19:44, the fourth at 19:59). She also ran 4 x 1000 at CV pace on a 2:30 recovery on flat loop averaging 3:36 - exactly 18:00-flat pace for 5K for a workout that is “comfortably hard.” Based on her workouts, I’d say she’s about 90 seconds ahead of where she was last year. IF they all stay healthy, this could be a REALLY good girls team. First race is a 4K and she’s hoping to open up sub-15:00, the equivalent of sub-19:00 for 5K. Second race is Sept. 8 in Omaha, NE. I’ll keep you posted. Should be fun. It’s been a GREAT summer of training and the whole group - guys and girls - is way ahead of where they were last year. Looking forward to the season! Are you coaching both the Boys and the Girls teams? Is that new? I look forward to following the team thru a coaches eyes. Not new. I was an assistant XC last year as well. Not track, just XC. cool - keep on truckin’! Young team ----3 Sophs and a Frosh were the first 4 scorers. I understand you had very hot day to deal with. Girls went 1-2-3-4-7 at smaller meet that still had several decent larger schools. Destroyed one of the best teams from the largest class. Twerp went to bed sick and woke up feeling even worse. Didn’t decide to run until an hour before the race, then went and broke the school record and won in 19:09. Bummed because she knows there’s an 18:4x or 18:5x in there but was just happy to win. Now PRd four consecutive weeks regardless of course or conditions. Frosh was second, also under old school record, #3 girl just 2 seconds over. The best news was our #4 girl, the won who has the seizure issues, who had a massive breakout race after lenghthy down time dealing with both injury and neurological issues. Guys also won, beating the team that was third at state by 25 points. The significance of that is that the top three teams at state were all from our regional and they only take three from each region, so our guys missed going to state last year. Girls still undefeated against all KS schools in all classes that they’ve raced. Guys have only lost to one and beaten all the teams in the largest class. 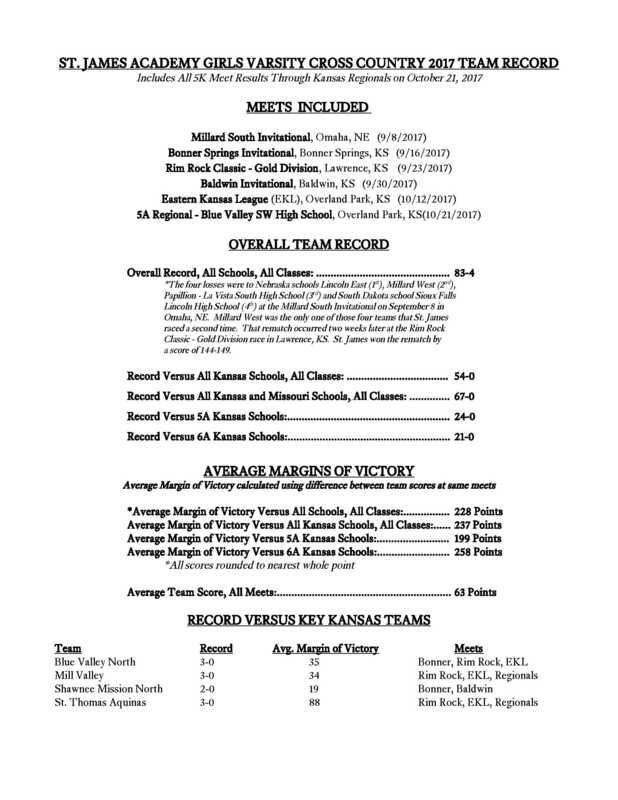 Team continued their undefeated streak against all Kansas and Missouri teams, all classes, by winning EKL. Twerp was frustrated being “only” fourth but had to be reminded that this race is actually more competitive than the state field will be because it has the top 3-4 5A and 6A schools in the state in their league, and at state she’ll only have the 5A. Her archrival beating her 28 seconds didn’t sit too well, either. On the other hand, this was her fifth consecutive PR in the last five races, her first sub-19 (18:59) and the second week in a row she lowered the school record. She’s now almost a minute ahead of where she was last season. Also, Hannah Robinson (second from left in the pic in the link) is the girl with the neurological issues I’ve describe before. She had an episode begin during the race but although she was almost a minute slower than a similar course two weeks ago, she managed to finish but was then unconscious for about 45 minutes or so. Regained enough consciousness to accept the traveling team trophy. Funny story about that “traveling” team trophy. It only has one schools name on it - St. Thomas Aquinas, our rival. They’ve won it I don’t know how many times in a row. Upon noticing that, one of the girls quipped that “even though it was a traveling trophy, it looks like it’s been trapped in the same house. We need to make sure that it gets it out more.” And thus was born the idea of taking the trophy everywhere and posing it for picture doing vacation type things - have a drink wearing a Hawaiian shirt, going to Royals or Chiefs games, fishing, etc. then compiling the pictures in to a vacation photo album to be passed along to whoever wins it in the future. When is her state meet? Things are sure looking like a championship trophy for that one! Regionals are this coming weekend (top three qualify), 10/21 with State the following weekend 10/28. Twerp ran her 6th consecutive PR and 3rd consecutive school record placing second (again behind Sovereign) at Regionals with a time of 18:51 in 20-25mph winds. Girls remain undefeated in the last six weeks. Scoring 5 averaged 19:12 despite a slow course and brutal wind. State is Saturday. Supposed to be 28 degrees that night with a daytime high of 54 so it will warm up fast. Girls run at 12:20pm Central time. People are just beginning to wake up to the fact that this is one of the better HS girls XC teams in the midwest when everyone is healthy. Take a gander at the stats I compiled when I couldn’t sleep one night. Is the team planning on entering any postseason regional or national invitationals? Yes, they’re running NXR. We’re in the Heartland region in Sioux Falls, SD. That course is lightening-fast if weather holds. Pancake flat and run around some soccer fields, it’s basically a grass track. Yesterday I pulled out last years NXR results. After comparing the NXR times with times on courses around here for several kids, it looked like 45 seconds was a fair yet still conservative adjustment. So, I adjusted our girls times by 45 seconds then looked to see where that would’ve placed them and added up their score. They were third. Top two teams qualify for NXN. It could actually happen. Still a long shot, but by no means impossible if Hannah avoids any neurological issues and everyone runs as expected. — 7 straight team wins in 7 straight meets, including Rim Rock Gold Division (repeating) EKL (tougher than State; first league title; snapping Aquinas 8-year win streak), Regionals (repeating) and a first-ever State title (snapping Aquinas 4-year win streak). — 4-0 against the next two 5A teams at State. — 2-0 against the top two 6A teams at State. — Scoring 5 average 3 seconds faster than individual school record was at start of season.